Hailed as the region’s premier farm show, the event in Syracuse features more than 400 exhibitors across 230,000 square feet. This year’s gathering is the 31st edition of the New York Farm Show. The show will bring together the worlds of farm products, services, and equipment from February 25-27 at the New York State Fairgrounds. Doty will man the Salford booth #DFD, showing products from the Salford, Valmar, and BBI product families, while the Salford Aerway line will be featured in booth #UD by area dealer Eben Weil. In the Salford booth, Doty will educate producers about the advantages of Salford Group equipment. Across all product families and lineups, Salford Group equipment is built for soil productivity, reducing waste and maximizing yield. Highlighted equipment on display includes a pair of precision applicators from the Salford BBI family of broadcast spreaders. The BBI Cricket Vineyard is a precision fertilizer spreader designed for orchards and vineyards. Cricket Vineyard is optimized for these tight environments with adjustable track widths and special tires, and it’s towable on tractors and other small tools. Also featuring at the New York Farm Show is the BBI MagnaSpread, the company’s flagship line of precision applicators of fertilizer and lime. Optimized for precision agriculture, it is standard-equipped to take on all major technology suites for variable-rate application and field guidance, including the company’s proprietary Task Command System. The 10-foot model showcased by Doty at NYFS is optimized for small farms and golf course environments. the field finish characteristics of the I-1200 or I-2200 (five-inch spaced models). The front two rows of the machine utilize the same rubber cushion concave blade coulters and spacing found on the I-4100. Featured on the rear rows are 50 percent more Coil-Tech II wavy blade coulters with 22-inch, eight-wave blades than on the I- 4100. This results in an overall spacing of five inches throughout the entire machine. The I-4200 on display at NYFS will be mounted with a Salford Valmar 55 series implement-mount granular applicator, which allows tillage and seeding in a single pass. Also heading to the New York Farm Show from the I-Series is the I-1200. Designed for the finest surface tillage available, the I-1200 uses the Coil-Tech Coulter I, 1 1/4” independent blade mounting system, to carry blades on the five-inch spacing. The I-1200 model averages 40 percent more blades and 39 percent more weight per machine than the standard I-1100, which uses seven-inch blade spacing and a lighter frame. The I-1200 on display at NYFS will feature Salford’s SwitchBlade Shank attachments, which allow for anhydrous application or deeper banding of liquid and dry fertilizers. The shanks can change wear points to convert from fertilizer applicator to a chisel ripper. SwitchBlade’s standard bolt pattern allows you to choose between Salford’s quality parts and most other industry-standard wear parts. A staple in the Northeast, Salford's 6200 moldboard plow features hydraulic vari-width to quickly change furrow width in operations that need to cut a variety of depths, incorporate multiple types of residue and/or waste, and have a variety of horse power requirements. 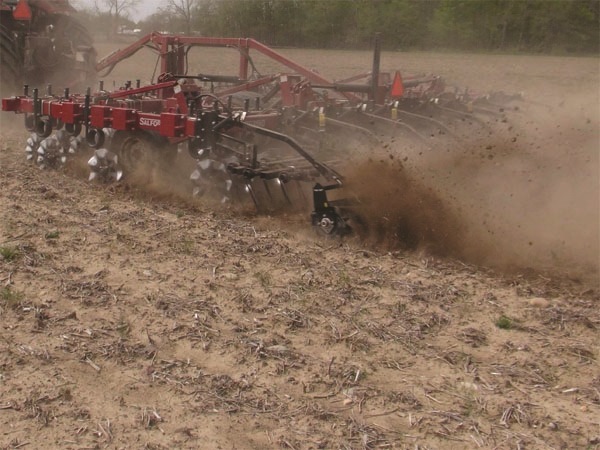 Furrow width adjustment ranges from 12 inches to 20 inches. Making its New York Farm Show debut alongside the new I-4200 is the recently launched Valmar Airflo 8600, a high-capacity, pull-type pneumatic fertilizer spreader. The 8600 boasts immense field-covering capabilities, as it features pneumatic booms available up to 66 feet. Also the largest-ever spreader to emerge from the Salford Valmar line, the 8600 combines mammoth hopper capacity with precision metering delivered by a ground-wheel-drive system that adjusts application rate on-the-go, ensuring uniformity of material spread regardless of ground speed. In the AerWay booth, the team will showcase the AerWay 15-foot CCT (Close Coupled Tandem) model for advanced aeration tillage. AerWay’s patented CCT system utilizes two overlapping tined rollers with three tines per row, giving farmers more pockets and fractures per acre.